Green is everywhere this spring. From natural hues to bright lime, green is the perfect way to add a fresh and vibrant touch to your home. Check out these top buys. Bring the outdoors into your kitchen with green accessories. Leave the usual chrome, white or black in the cupboard and brighten up your surfaces with bold colouring. 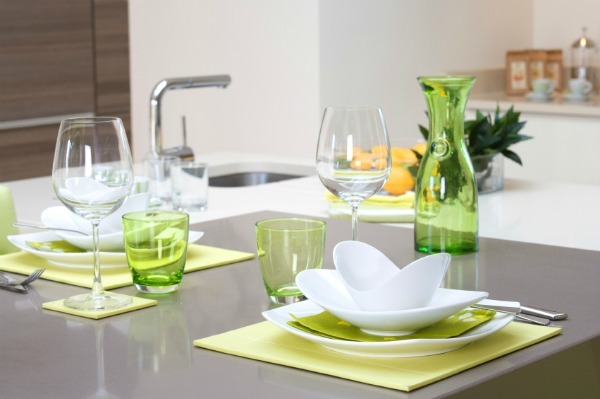 Green crockery immediately brightens any cupboard and brightens a dull, bland kitchen. Try this vintage-style scales, for £10 from House of Fraser. Leaf prints are a great alternative to traditional floral patterns and make a great statement feature. This Lana leaf cushion, for £35 from John Lewis, will inject a bit of green to your living room. Mix it with plain greens for a soft and natural look, such as this silk cushion, for £20, also from John Lewis. This retro round table lamp, for £70 from Ikea, gives a classic and modern look to any home. The statement piece is the perfect way to update tired decor. Team it with neutrals for the ultimate effect. Update your bedroom with this Betty Jackson-designed bedspread, for £24 from Debenhams. The meta-design and lime green colour make for a vibrant and fresh look that will instantly brighten your room. As the colour most associated with nature, green is the perfect tone for your floral masterpiece. This oriental-inspired, green vase with pink corsage, for £13 from Debenhams, is a dramatic and bold style for your home. Team it with willow twigs, for £6 from John Lewis, for an eastern-inspired display.